Firstly I need to apologise as my blog tour should have been next week on the 2nd October but unfortunately I could not do that date and swopped tour dates with http://www.baattyaboutbooks.wordpress.com so now her review will be in place of mine then. I would now like to say a massive thank you to Helen Claire and Bloodhound Books for inviting me to take part in this Blog Tour. This is the first Alex Walters novel that I have had the pleasure to read and what a brilliant book it is. I have since I finished reading this gone on to buy a previous novel by him. Who will live and who will die? DI Alec McKay is a man haunted by the loss of his daughter. As he obsesses over a missing person case that is going nowhere, McKay’s investigation is interrupted when bodies start appearing on the Scottish Black Isle. Soon McKay and his team start to identify a disturbing pattern behind the killings. 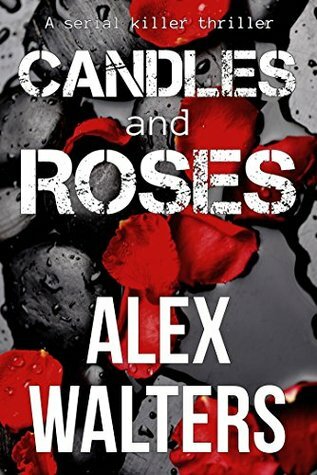 Candles and Roses is the first book in the explosive new DI McKay Series. What a belter of an opening chapter, don’t think for a minute that this is going to be a get to know the characters kind of opening because it isn’t, it’s a let me just show you what you are letting yourself in for kind of opening and boy this doesn’t disappoint! I felt like one of Alex Walters victims as before I knew what was happening he had taken my breath away. I was the silent witness in this story where I had a tremendous feeling of sadness to the killings, more than normal somehow. It was the innocence of his victims that he captures so very perfectly in his writing. As a reader you know what is going to happen, there are moments similar to the situations where you cringe and want to shout no. You can see it but you keep reading wanting them to hesitate, to realise. You slow your reading you want to give them that chance. They feel real like you could make a difference. I liked the pace of this story where there was the chance of danger on every page. Set in Scotland D.I. Alex McKay spends far to many hours trying to solve the worst of criminal cases instead of facing his wife and the problems that they haven’t learnt to face together in their lives. I really took straight away to this D.I. that Alex Walters gave an unforgettable realism to, where what affects him in his home life also affects how he deals with problems at work to the point of obsession and not knowing how to let go. This is the first book in a new series for Alex Walters which I am positive will gather quite a following very quickly, myself being one of them. I wish to thank Bloodhound Books for an advanced copy of this book in exchange for an honest review. Alex has worked in the oil industry, broadcasting and banking and now runs a consultancy working mainly in the criminal justice sector including police, prisons and probation. As Michael Walters, he has published three crime thrillers set in modern-day Mongolia. As Alex Walters he has written two thrillers set in and around Manchester and featuring the undercover officer, Marie Donovan, Trust No-One and Nowhere to Hide. His new book, Late Checkout is the first in a series of crime thrillers featuring, alongside Marie Donovan, the rather distinctive DCI Kenny Murrain. The second book in the series, Dark Corners, is scheduled for publication in Autumn 2016. Candles and Roses, the first in a new crime series set in Scotland’s Black Isle, is due out in September 2016.